Africa Screams. Nassour Studios Inc 1949. On the one hand, Abbot and Costello. On the other, the theme park version of stereotypical Darkest Africa. Not sure how I’m going to feel about this, but the cartoon native on the poster isn’t helping. I thought I’d already done an Abbot and Costello, but I was thinking of Laurel and Hardy in The Flying Deuces, so I don’t feel like I’m retreading much here. Even though star vehicle series don’t have continuity, I’m reluctant to revisit duos. Bookseller Stanley Livington is deathly afraid of all animals , so of course when Diana comes in inquiring after a sold-out book about Africa with a map she’s very interested in, Stanley’s boss Buzz makes him out as an African safari expert. At first, Stanley is only to draw a copy of the map for them, but Buzz overhears enough of her plans of an African expedition to get the diamonds the map leads to that he ascertains the trip will be a lucrative one, and talks his and Stanley’s way into the trip, which they’re told is for the purpose of capturing an Orangutan Gargantua. Once they get to Africa, it turns out that Diana’s team plan to dispose of Buzz and Stanley once Stanley reproduces the map for them and so ceases to be useful, Stanley actually doesn’t remember the right map, and there’s an ape stalking Stanley. 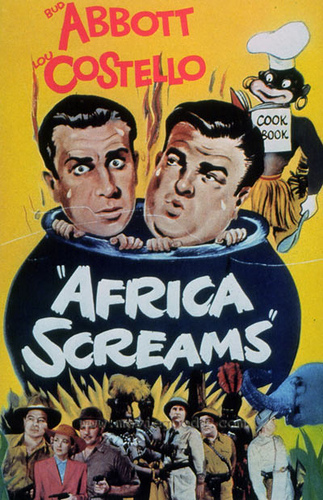 Of course, the point of the movie isn’t the plot, it’s setting up a series of comedy scenes in the African jungle. However, I found that there came a point where the plot seemed close enough to resolution that I was ready for it to wrap up already rather than getting distracted from it again. That point was less than an hour in, even before the African cannibal tribe showed up to complicate everything. Perhaps the degree to which I really wasn’t into it wasn’t entirely the film’s fault, but the comedy rarely seemed to be funny enough to justify itself as a diversion from the story. I actually don’t have much of a problem with the depiction of the cannibal tribe. They seem like a prerequisite for jungle movies of the time, and don’t come off nearly as stereotypically as they could have, giant cookpot and broken English aside. They just put a bunch of black actors in Hollywood’s impression of African tribal garb, and it seems pretty reasonable and grounded for the day and genre. They don’t come off as sympathetically as the ape that’s taken an interest in Stanley, but I’ve seen worse. Maybe I missed an important early scene with the ape, but I don’t understand why it’s following him the way it is. Apparently an early draft had it be a love-struck female, but that was changed to appease the censors, leaving it without an apparent motive. Maybe that’s funnier, but I was just confused. I keep calling it an ape because it’s meant to be seen as the Orangutan Gargantua, but it’s neither gargantuan nor does it look at all like an orangutan. It looks like a man in a gorilla suit, so I want to call it a gorilla, but I can’t because the movie doesn’t call it a gorilla. I’m not certain how common it is for Abbot and Costello, as I don’t remember from the one or two other movies I saw years ago, and it’s not the case with the old radio show episode I recently listened to, but their characters have an interesting distribution of mischief. What I’m familiar with in a double act is the comic character blundering into situations through sheer ignorance or through trying to be clever and the straight character is just involved either because they’re friends for some reason, or forced together through circumstance. Here however, while Stanley does get into trouble because he’s not very bright, he gets into more trouble because Buzz’s scheming backfires on him. They aren’t friends, they’re boss and employee, which is a dynamic that continues even when they leave the bookstore that established that relationship between them. This is altogether an interesting approach that I find more satisfying than either of the other double act dynamics. A vehicle comedy is rarely very long on story, which makes it a challenge under the right circumstances for a viewer like me. Perhaps I would enjoy this more if I saw it again later, but I wasn’t very impressed this time. There’s a lot of Abbot and Costello out there to enjoy, so it’s not so much of a problem if I find this one shakier than others. It’s just one more context to put the duo in.